Liberty to the Captives is a book for any Christians who want to learn how to bring hope and redemption to their communities &- for those who are ready to step beyond their comfort zone, leave the status quo behind, and take up Christ's call to minister within a world crying out for the freedom only God can bring. Longtime pastor Raymond Rivera's testimony of a life completely turned around &- from gang member to RCA pastor &- underscores his powerful message. Full of practical advice about how holistic community-based ministry can bring transformation, healing, and liberation from captivity, Liberty to the Captives encourages Christians to respond to God's call by ministering wherever God has placed them. Based on over forty-five years of pastoring inner-city churches, Rivera's inspiring vision challenges all Christians to think again about how their faith should lead to social action and defense of society's most vulnerable people. 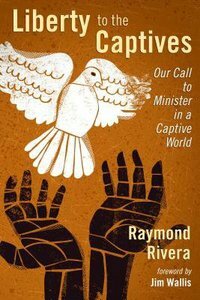 About "Liberty to the Captives"
Raymond Rivera is founder and president of the Bronx-based Latino Pastoral Action Center and a recipient of the 2012 Micah Justice Award from New York Theological Seminary. He has preached, taught, and modeled Christ-centered holistic ministry in various churches and developed numerous parachurch ministries in different parts of New York City.